How can I do a good job, when no one seems to understand what my job is? Alas, this is a typical problem for development directors at organizations where the development department is one, maybe two (more likely one and a half) people. And the expectation is that they will “raise funds” for the organization. 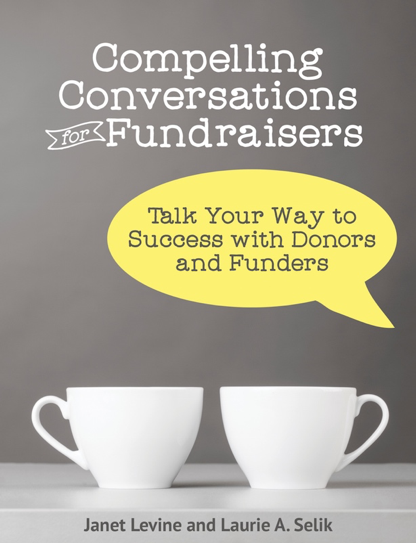 “Raising funds” you understand means running events, writing grants, sending out annual (or semi-annual) appeals, getting corporations interested and oh, going out to talk with major donors one by one by one. Not to put it too finely, but this is ludicrous. Each of those things requires different skills and substantial time commitments. This particular client and I spent a lot of time crafting a nice development plan, with cultivation steps for every major donor; timelines for all other activities, goals that met the needs of the organization. And when we were done we shook our heads and said “no way,” for in addition to development, my client is responsible for communications and for recording all gifts, sending out all thank you letters, and going to the local Rotary club lunches each week and all Chamber events. I work with a lot of organizations where there is no development director, so in a way, this client is ahead of the curve. But the curve has too much of an arc, and she is not ahead enough. You’ve all probably heard about SMART objectives (or goals). They are Specific, Measurable, Achievable, Realistic and Time bound. Shouldn’t our expectations for development directors be equally SMART? I started fundraising at a large research university. I had the luxury of working with a specific number of prospects at a certain level and I was expected to cultivate and solicit them in a reasonable amount of time. To be honest, as long as I did my job, it was pretty easy to be successful. I could be SMART about everything I did. When I got into organizations where my role was not quite so specific, it was much harder to get things done. I was flitting from thing to thing to thing, losing momentum, and as a result not getting as much done as I wanted. As a sole proprietor, I do tend to do it all. But I can do that because I control which jobs I accept, and what I say no, thanks to. In order to be more successful, I have created clarity about the work I do—I am Specific. I can Measure if I am accomplishing what I am hired to accomplish. I make sure the scope of work is achievable and realistic, and the Attorney General insists that all my contracts have beginning and end dates, so I am by law time-bound. If you are a development director—or if you are hiring one—consider making the job description SMART. It doesn’t take genius to recognize that a smart fundraiser will raise more money than a dumb one. Janet Levine works with nonprofits, helping them to increase their fundraising capacity and build stronger boards. Learn how she can help you at www.janetlevineconsulting.com. This entry was posted in development programs, fundraising and tagged clarity, cultivation, development, development directors, fundraising, Job Descriptions, SMART. Bookmark the permalink.